Receding gums is a common dental problem that happens gradually and oftentimes goes unnoticed. It can lead to tooth decay, bone, tissue, and tooth loss. When bacteria in the mouth increases, pockets form between the teeth and the gums. This causes the gum line to wear away and expose more of the tooth. If you are exhibiting the following symptoms, you may have developed receding gums. Brushing your teeth too hard: Brushing your teeth too hard or using a hard-bristled toothbrush can cause the enamel on your teeth to wear away causing your gums to recede. Diabetes: High diabetic levels can cause bacteria to increase in the mouth which can lead to receding gums. Genes: If your family has a history of receding gums, you may be predisposed to gum disease. Gum disease: Gum disease is the main cause of receding gums. Increased bacteria in the mouth causes inflammation and infections that destroy gum tissue and bone that hold teeth in place. Hormones: Fluctuating hormone levels such as puberty, pregnancy, and menopause can cause the gums to be more sensitive making you susceptible to gum recession. Poor dental hygiene: Not following good dental hygiene practices will cause the bacteria in your mouth to increase. When this happens, the plaque turns into tartar. To avoid this, brush and floss your teeth twice a day and use an antibacterial mouthwash. Tobacco: Cigarettes and chewing tobacco can damage your gums and cause them to recede. Early diagnosis can slow down and prevent gum loss before too much damage occurs. Dr. Khanna can treat gum recession through deep cleaning and antibiotics. If there is significant tissue loss you will need gum surgery. 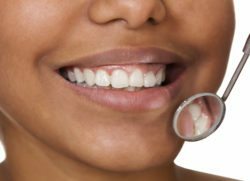 If teeth are lost or become misaligned because of gum recession, Dr. Khanna can offer several dental cosmetic options to replace lost or misaligned teeth. Dr. Neeraj Khanna and the team at Khanna Dentistry are available to help you choose the best gum recession treatment option that will improve your oral health and restore your smile. Contact us for a consultation.